I call this picture the Congressman’s Delight, or more accurately an ode to Chris Lee’s Jackass Decision. 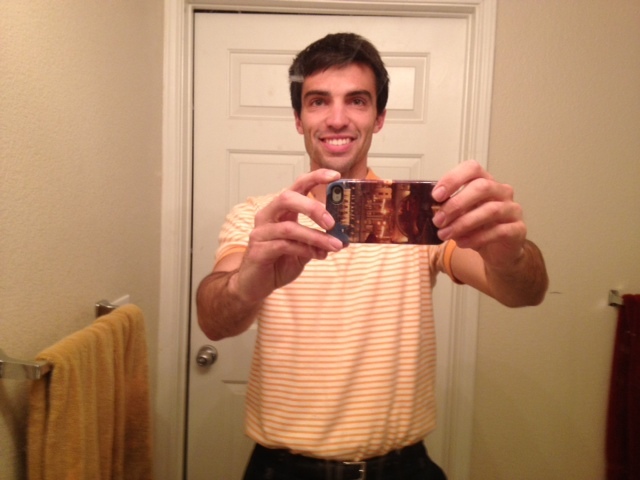 For him, this creepster bathroom mirror reflection photo, was used to lure a woman through CraigsList while posing as a divorced lobbyist. For me, this creepster bathroom mirror reflection photo is confirmation that I have joined modern society technologically (though sartorially I am still blissfully trapped in the early 90s as you can tell by that radical orange). That’s right, I have an IPhone. I’ve had one for about a month. I’ve caught up with culture. Depending on your age or entertainment preferences, you were either introduced to the cellular phone by Gordon Gecko or Zack Morris. Morris (PREPPY!) would sneak his into Bayside and with the phone comparable in size to that of an adult meerkat, he had trouble hiding it, leading to many a detention from Christopher Richard Belding. Gecko used his for prestige, for calling the hussies Charlie Sheen would meet in his stretch limo. In reality, these cell phones were novelties that looked and probably functioned as reliably as walkie-talkies. By the late 90s, that changed. My dad bought a cell phone for my mom around this time, meaning suburban white moms, bellwethers for when any technological trend has reached the masses, had discovered cell phones. In other words, the world had discovered cell phones and very much liked them. You know how they have progressed since then. We saw the Morris phone turn into a smaller form that still flipped up, the awkward flipper that had a sweet Snakes game on it, the Motorola Razr, the Euro-cool Vodaphone, the Sidekick, which actually featured a standard QWERTY keyboard, something called “Chocolate” and then finally the IPhone. The IPhone was released in the summer of 2007 and really did change the world. Everyone must have a Smart Phone now. You can read news in your hand. You can watch entire episodes of Entourage. You can text photos with ease and dress them up to look like Don Draper would have taken them. You can play ANGRY BIRDS! If you feel lonely or awkward at a party, you can pull up Facebook and act busy. Phones have become part of us. Most of us. 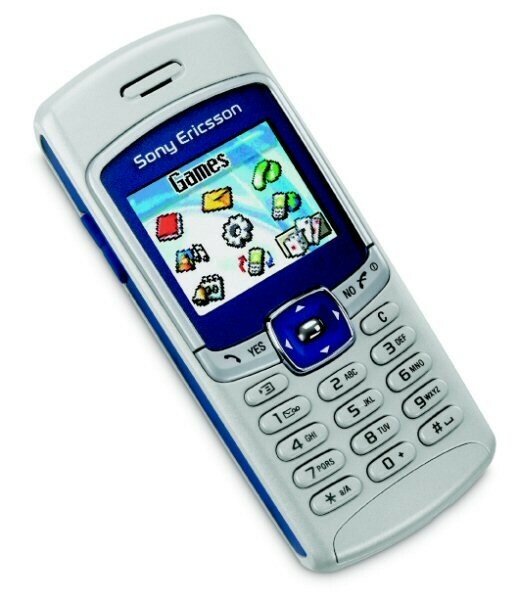 Until late December, I had never progressed past that awkward flipper phone, and mine didn’t even have Snakes on it. A fellow student wrote an editorial for the high school newspaper about cell phones when I was a junior. This was the message. You were lame if you had one, you were part of the machine, the type who listened to Good Charlotte and considered them indie, the type who quoted Napoleon Dynamite every freaking day and thought you were the only one who did it. I was not that type. I wore shoes that didn’t have shoelaces largely because this was a perfectly passive-aggressive way to piss off the school administrators and dance around their so-called dress code. I wasn’t really into following the “in-crowd,” unless that “in-crowd” happened to religiously read Runner’s World and secretly record rap songs in his parents’ study. Friend: Is Mark there? I thought this was his phone. Mom: (screaming) Central Park? Yes it is featured in Home Alone. This was only slightly more effective than the aluminum cans attached by yarn communication system for making social plans on Friday nights, so I asked for my mom’s cell phone full-time the Christmas of 2004, my senior year of high school. It was awesome, especially the ringtones. I set a synthesized “Copacabana” for my ringer and a ridiculously synthesized “Your Body Is A Wonderland” for my alarm. I could even text, something that I did not even know existed until the day after Thanksgiving of 2004. If I ever stayed up really late at night, I would text my friend Pat with the message, “ha,” in hopes of waking him up. * I loved that phone and didn’t realize anyone could consider it out of date until college. *SOOOO cool I know. Further evidence of my elite “in-crowd” status. 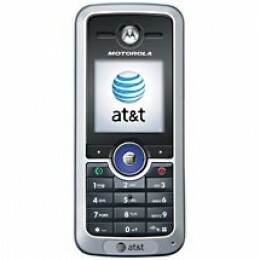 One day coming out of the dorm elevator freshman year I saw a girl holding the same model of phone I had. I pointed this out. She said she hated it, that she was getting a new one. Those new models like the Razr and the Chocolate had been released. The IPhone would come out a year later. The end was beginning; it just took me a while to notice, an accident to notice. One night on the way back from a bar my junior year of high school college, I dropped my phone, cracking the back so it would no longer slide into place. The battery and the SIM card were exposed. I now had to restrain them with a rubber band, an accessory that actually complimented my overall look, which consisted of green sweatpants, a tattered UCLA sweatshirt and coal soot dusted on my cheeks. It arrived on a Tuesday night in early December. I had plans for this phone, big plans. I wanted a cool ringtone, T-Pain’s “Bartender” to be exact. I got it, and that was all I needed. A year later, I went to Europe for a few months. Up to this point, my phone didn’t seem all that out of style. It sucked, sure, but I knew few other people who had Smart Phones at this time and still knew many who didn’t have the Sidekick style of phones. When I got back, everything changed. Everyone had an IPhone or the equivalent, or a Blackberry at the least. I felt like I was at a Radio Shack. People were whipping out all these new electronic accessories and berating me for owning a rotary cell phone. That was 2009. I wouldn’t leave Radio Shack for another two years. It happened so quickly. One second I was holding my Motorola, the next I had the IPhone with all my contacts in it, a warranty and plan purchased for it, and an offer from the AT&T salesman to feed it to a hungry alligator that was waiting in the back of the store. A couple days later, Christmas came, then my birthday and then the New Year. At the beginning of every New Year, I feel a little different. I remember everything from the year before and January 1 is technically arbitrary, but there is a clear delineation. I’m new, refreshed, always older, always viewing the coming year as a possibility for a new phase in life. 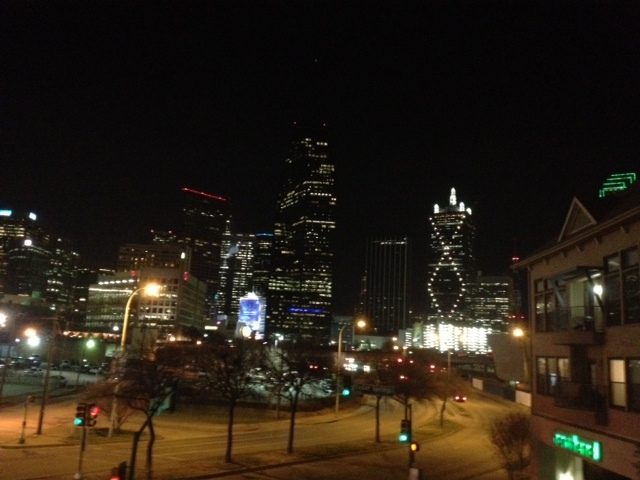 I’ve been in Dallas for the last three new years. This is crazy. Three years of the real world, three years of meeting new people, three years of adjusting. I used to struggle with new jobs, places or people, and, yes, new cell phones, but it’s starting to feel normal. So, maybe more so than every other New Year, I predict this one will be even better, that everything will come together. Of course, I’ll be asking Siri for plenty of guidance questions, generally ones regarding Taco Bell locations. Normally i use this men for aid because they submit relevant problems to what’s occurring surrounding the education approach.